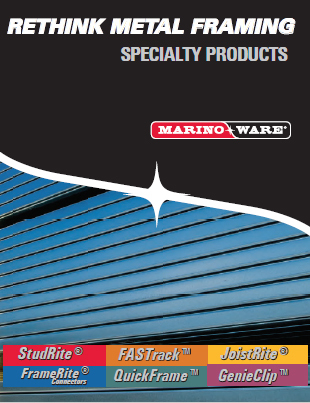 We at Marino\WARE understand that metal framing is not about one kind of product only, that each need is different, and that our steel will become part of a unique project each time it is used. With that in mind, we offer specialty products such as StudRite®, FAS Track 1000TM, JoistRite®, FrameRite, QuickFrame®, and GenieClipTM . As part of a comprehensive framing solution, each of these product lines offer a quality contribution to the next building project. Go ahead. Rethink metal framing. And take a look at our brochure to discover what we can bring to the table.